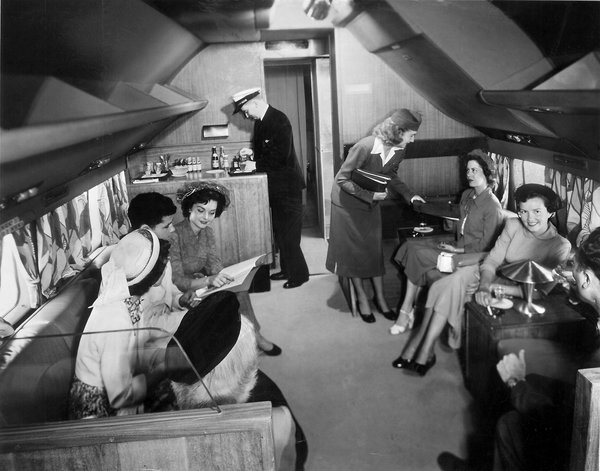 At the dawn of aviation aircraft interiors looked quite different, as we used to. It is now want to sleep – pay.And that was before? 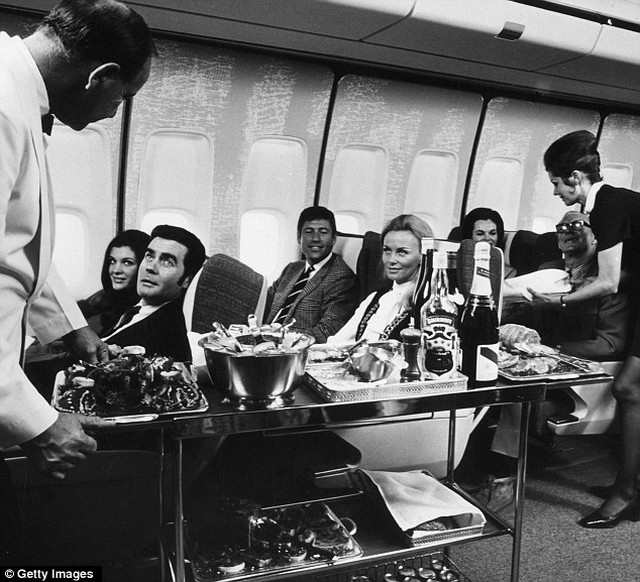 As previously flew privileged passengers? 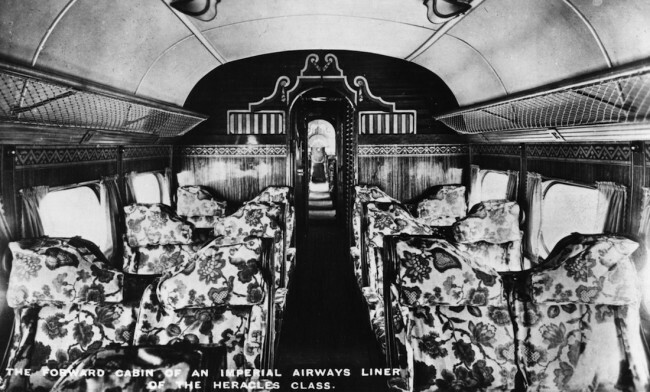 This question will tell you the story of the first class in aviation, which you will find below. 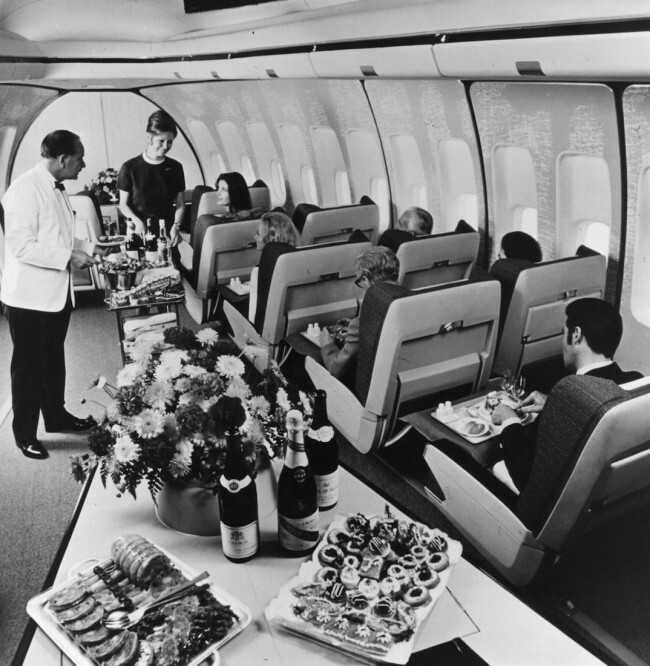 The very first aircraft were narrow and long, and the passenger seats were perceived as an innovation, a kind of luxury and an optional extra, like caviar sandwiches with butter. 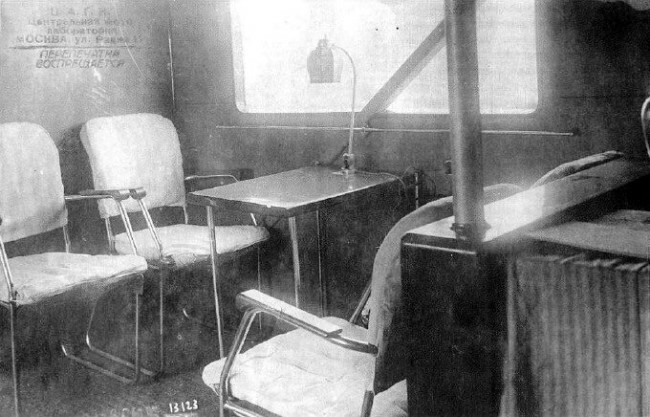 The first seats were the most common chairs, seat belts were not. 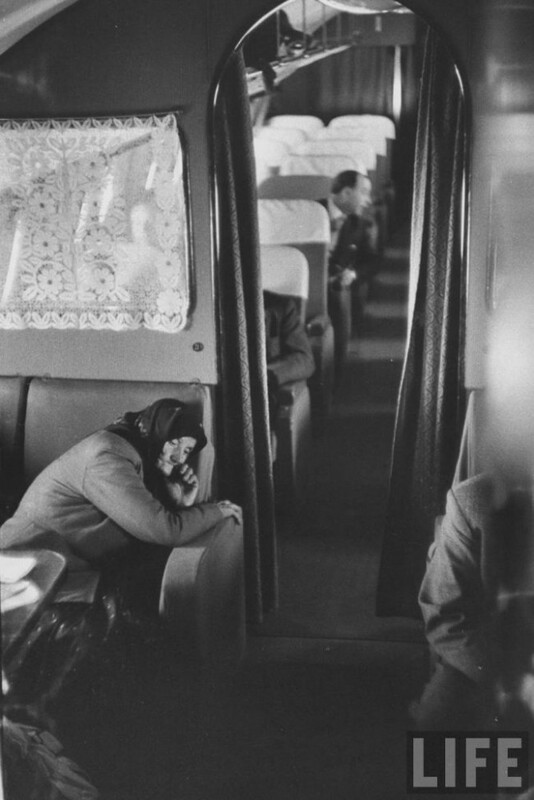 At first, the passengers were sitting right behind the pilot, there was no partitions. It looked something like this. 1926. 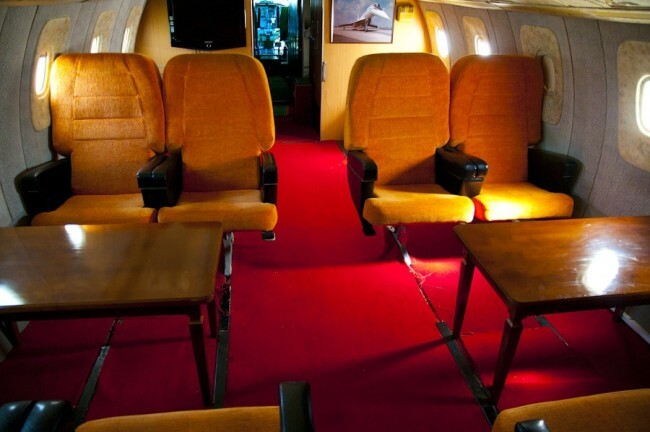 Heated cabin – a reason to be proud. 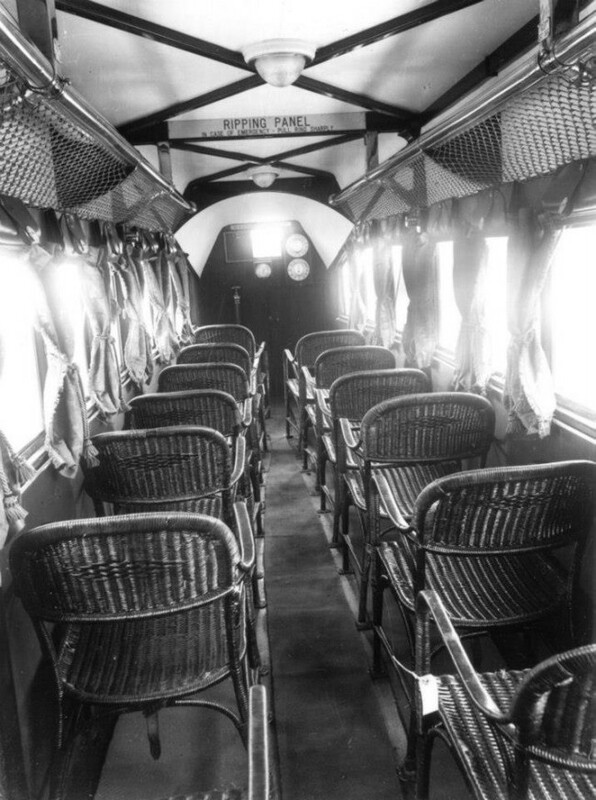 Aircraft became longer and longer, seats placed in two rows. 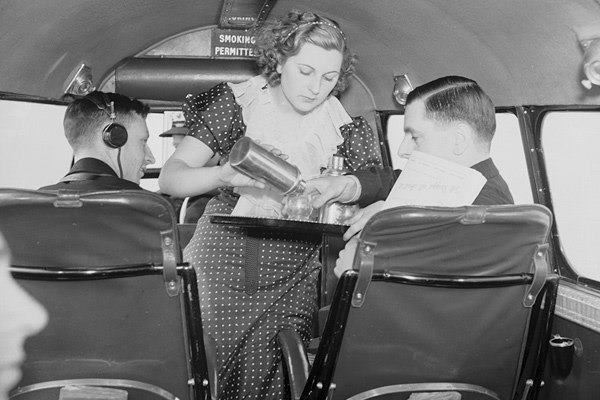 When the planes are more or less suitable for the commercial transportation of passengers, and there is a need for service personnel. 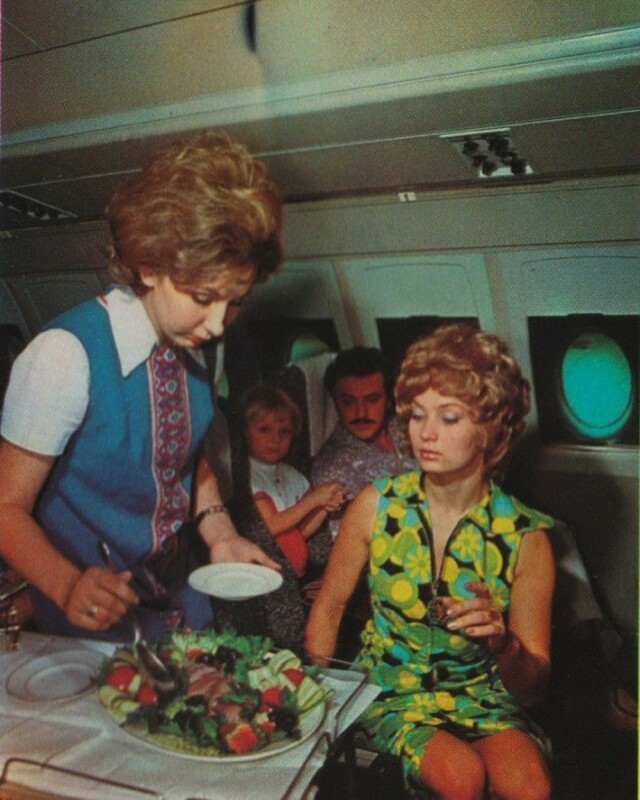 Here Ellen Church, the world’s first stewardess. Began working in 1930.Smoking is allowed! The ban on smoking – the invention of the last 20-30 years, before all smoked cigarettes, cigarillos and cigars, about the harm of secondhand smoke, no one thought. As in the best restaurants in Paris. 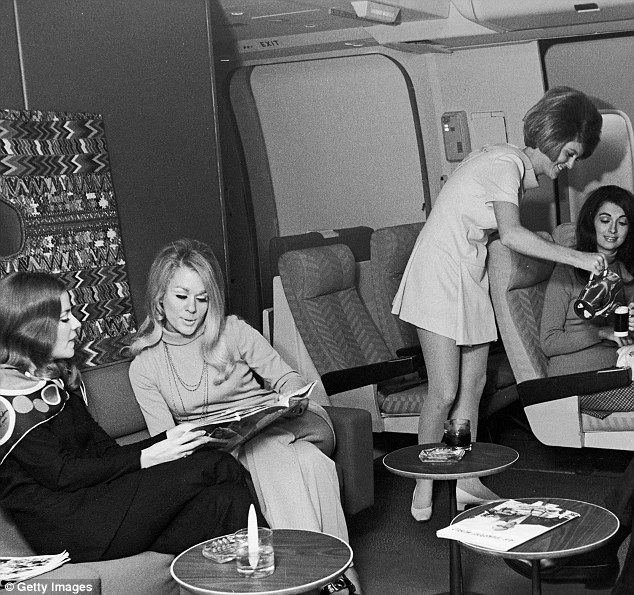 Something like a secular salon on board. Foundation of all foundations – a sound sleep. Talk about classes of service in this case is incorrect. 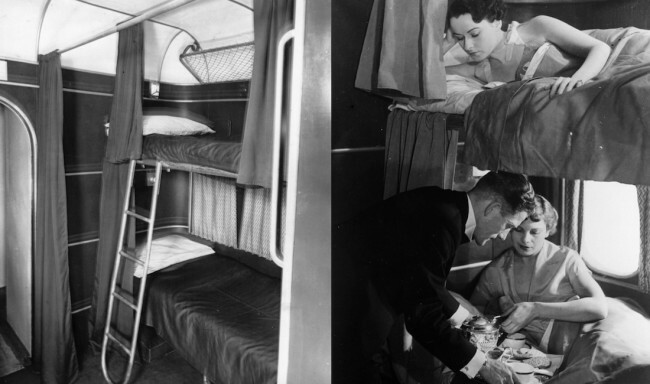 Prior to 1950-60-ies everything was first class tickets were very expensive, and afford to buy them could only wealthy people. 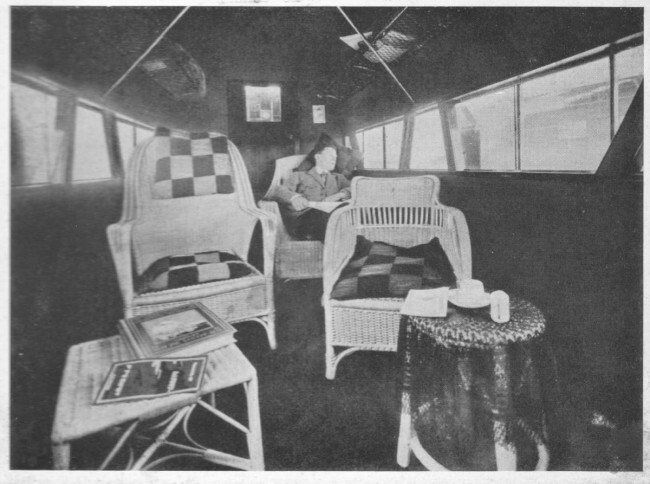 For example, the journey from London to Singapore was worth at the current rate of $ 17,600. The plane was a branch of secular salon where be in T-shirts and shorts, as we are accustomed to, it was considered unacceptable. 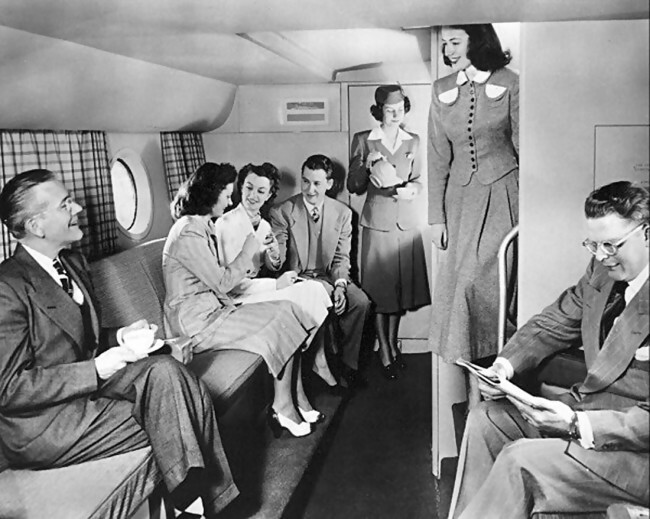 Passengers entered on board almost in evening dresses. 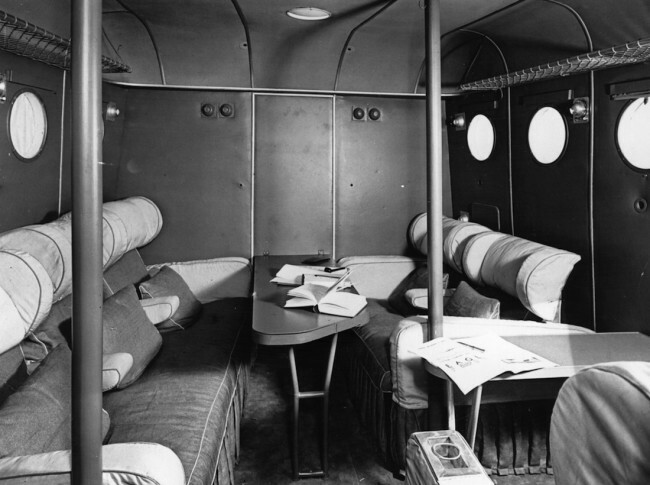 In the photo – American aircraft Sikorsky S40B, 1930. 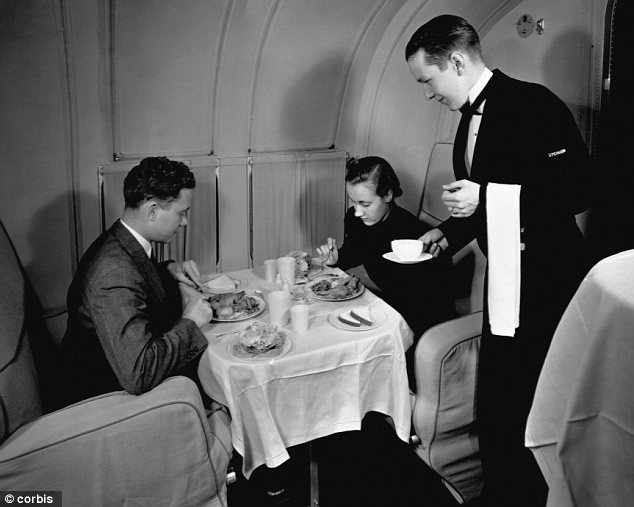 The same aircraft, gentlemen lunch. 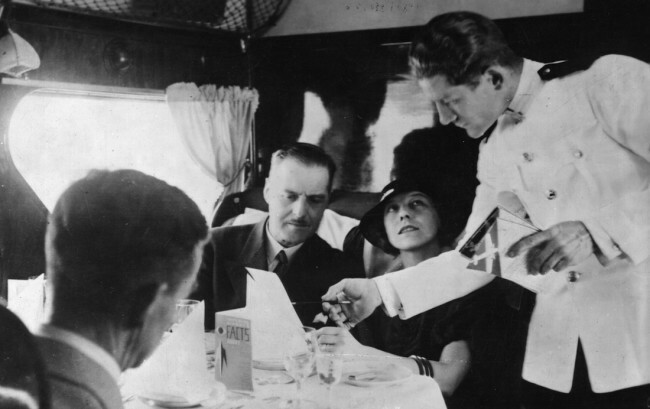 Please note: no disposable plates, and only a crystal, porcelain only!Also passengers in unlimited quantities offered alcohol. 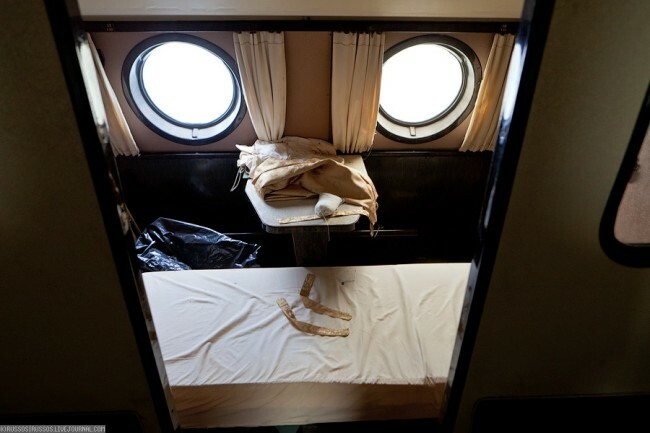 However, cases of drunken fights were rare, as potential brawlers – malovospitannye Strait – then selected at the stage of ticketing. 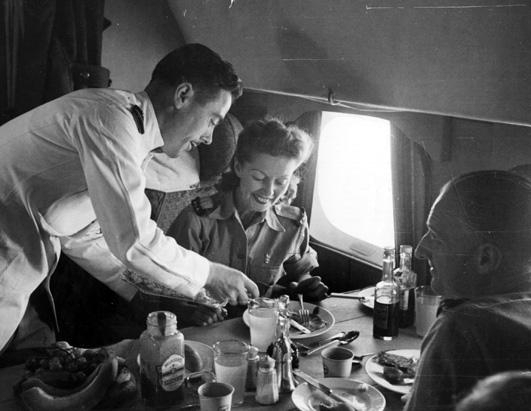 British actors Winifred Shotter and Jack Lester fly to India in 1945. The end of the 1940s. 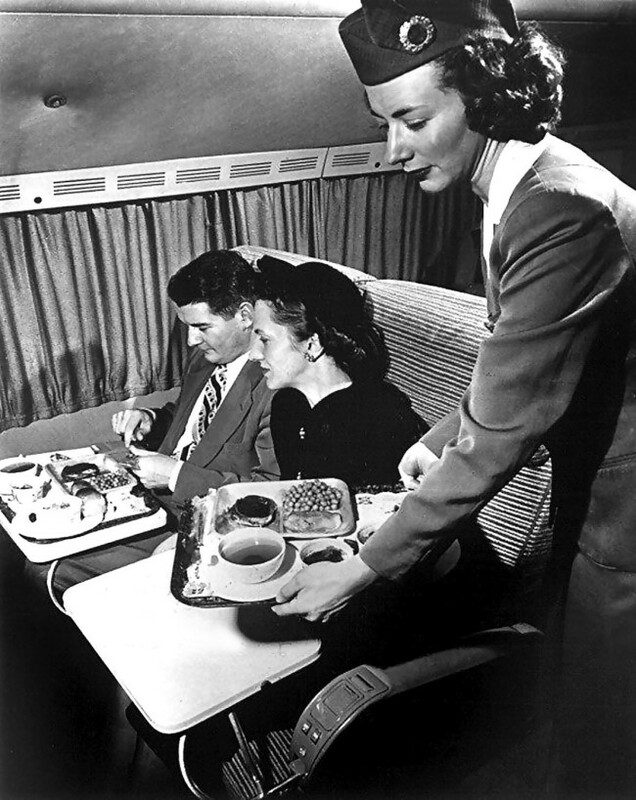 On airplanes could well serve lunch from 5-6 change. 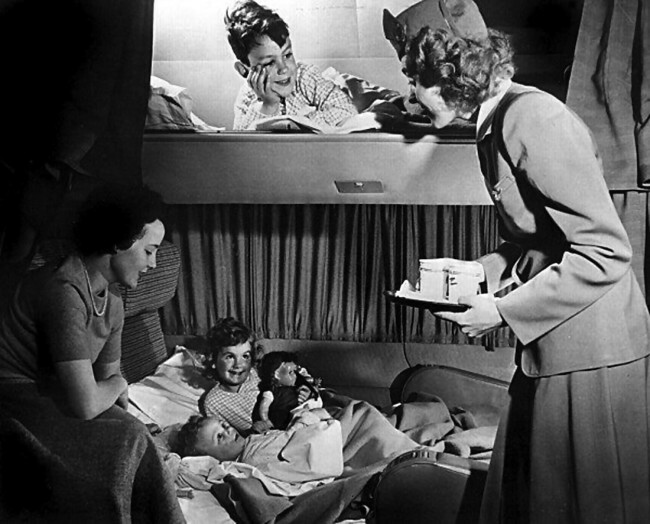 Aircraft are comfortable that you can travel with children, hinted to us these photos. 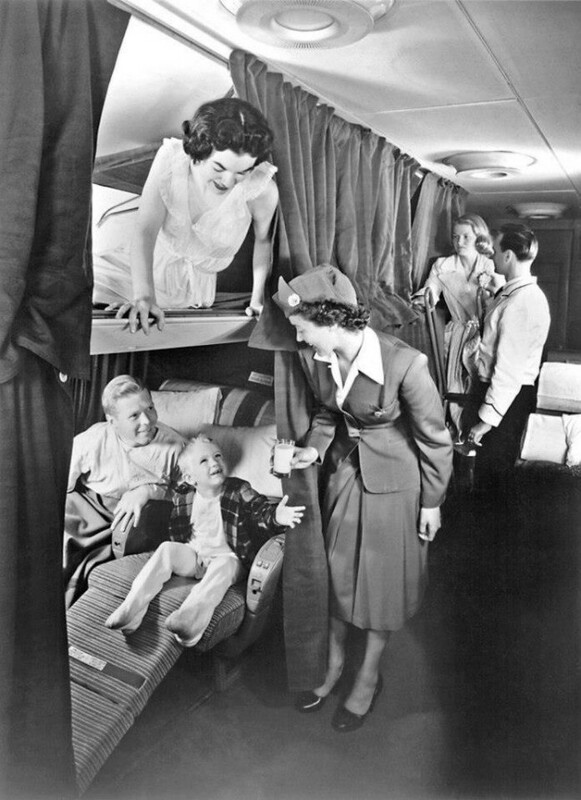 And this is 1952 and one of the first commercial jet aircraft. Woman doing cosmetic procedures specifically designed for this room. 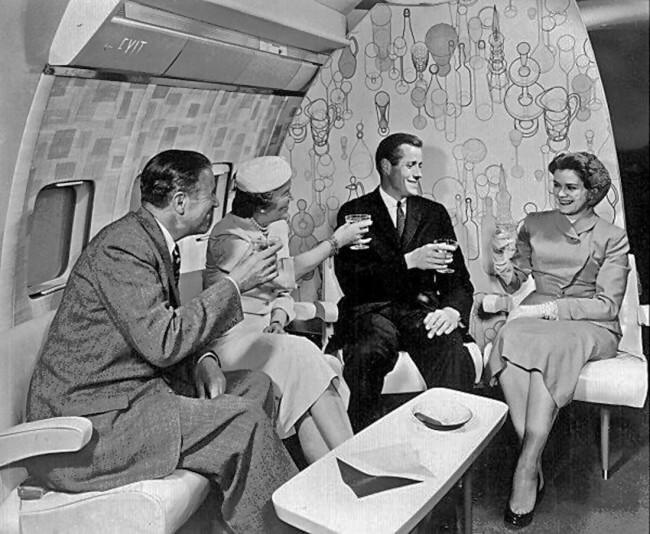 Boeing 707 began its operation in 1958 in Pan American, which in the 1960s was considered the most luxurious in the world avikompanii. 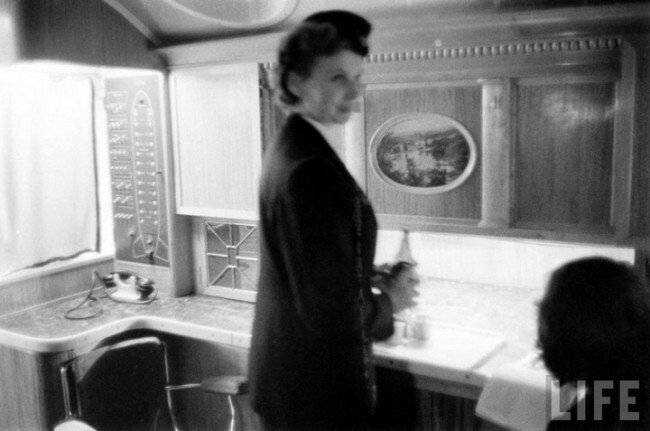 1959, passengers drink for love. 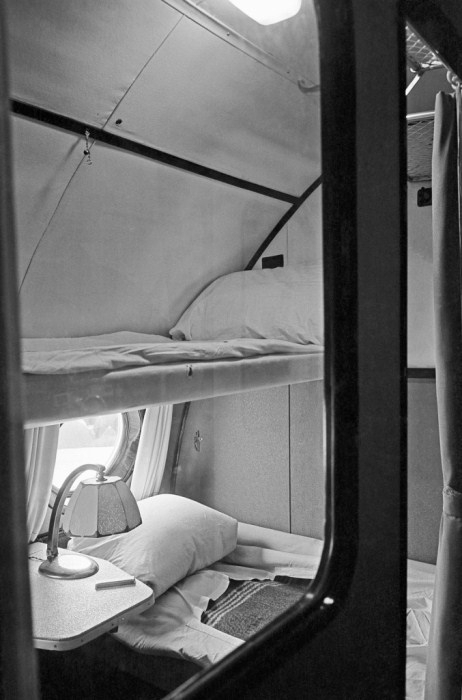 Are small talk in the cabin. 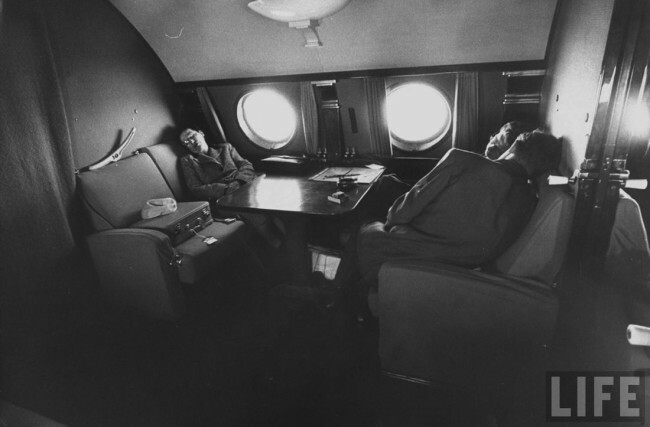 The next important stage in the history of civil aviation – 747. 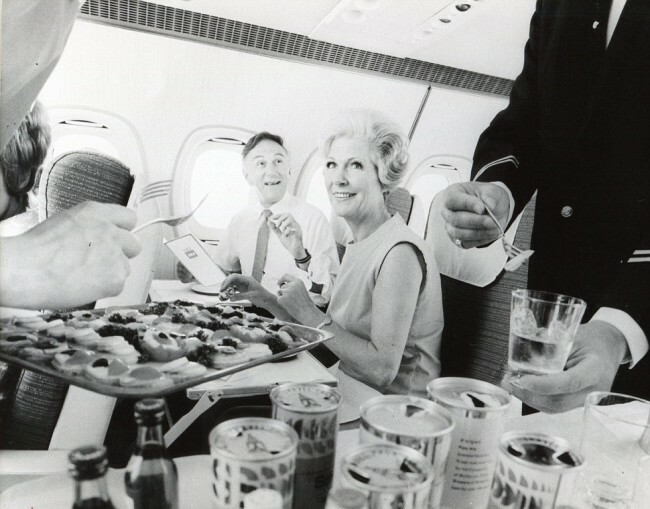 First class passengers are served lunch. Poured champagne. 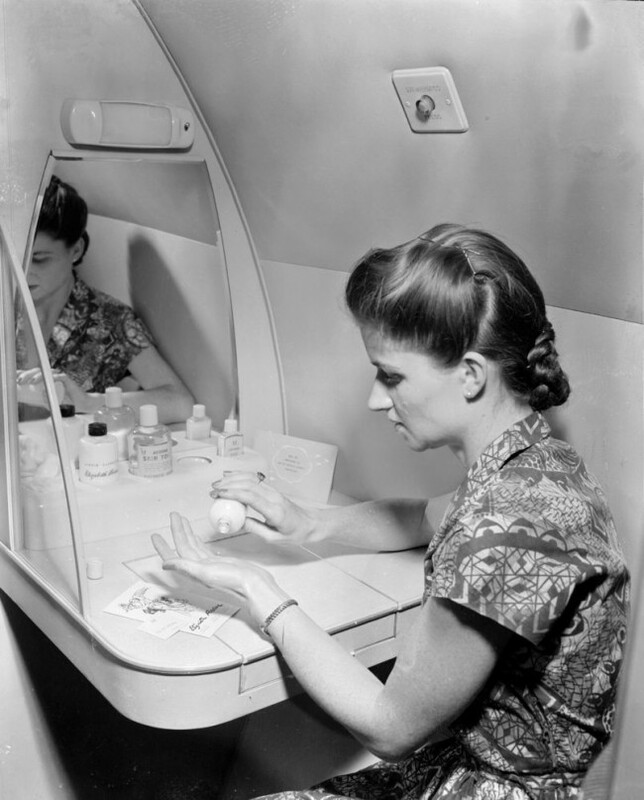 In those days, were presented to the flight attendants are very strict requirements. 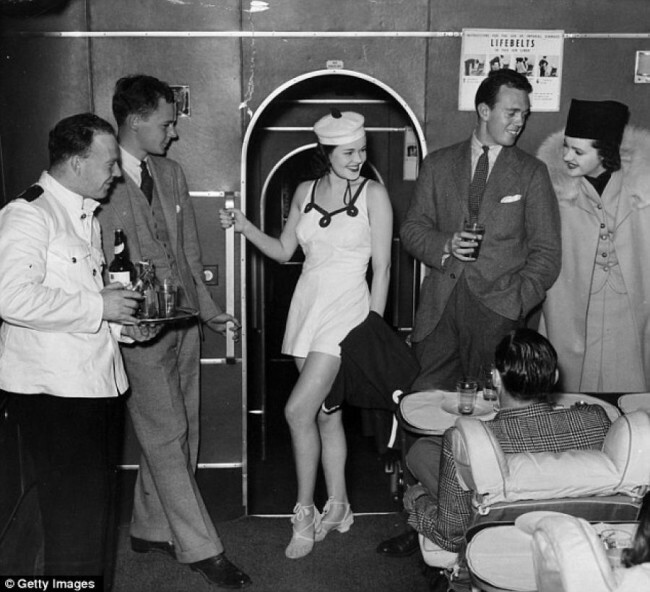 They had to show a combination of model looks, manners socialite, skills maids, waitresses and nurses (eg, if necessary, a flight attendant could take generations). There were formal criteria: weight 49 to 60 kg, age 21 to 27, of high moral character and the absence of her husband. In Pan Am during the interview the girls asked to translate a text from French to English, walk around the room to demonstrate gait and posture, and weighed. 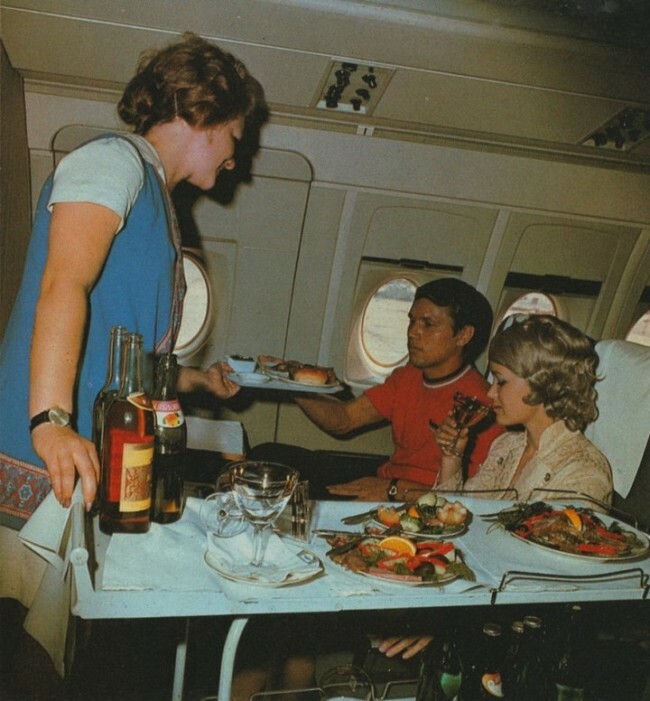 Those who are selected, trained airline etiquette, geography, national traditions of different countries. 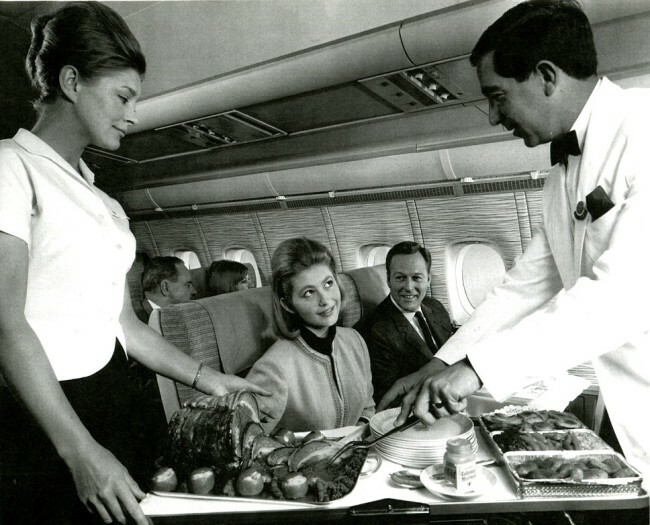 The mid-1960s, a flight attendant with high fashion hairstyle offers snacks. October 1969. 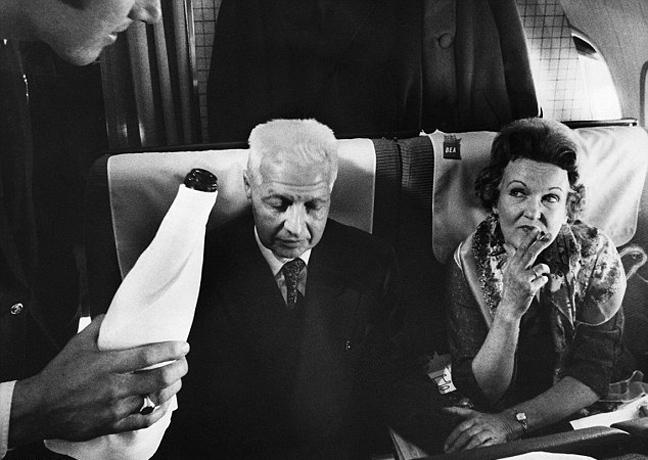 Soviet intelligence Leontine and Morris Cohen exchanged for his British counterpart, fly from London to Warsaw with all the comfort. Smoking is still allowed. 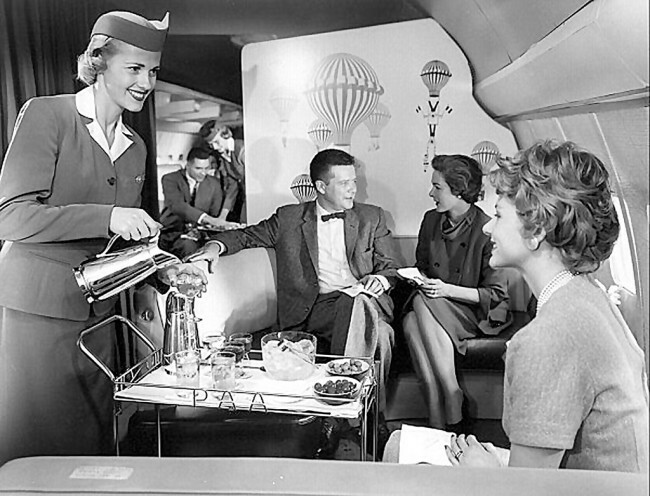 Reflections on the 1950-60-ies for civil aviation in the West invariably filled with longing for the lost luxury.But have you heard someday someone was sad about the Soviet airplanes? I have not. Let’s see how things were in the Soviet Union. 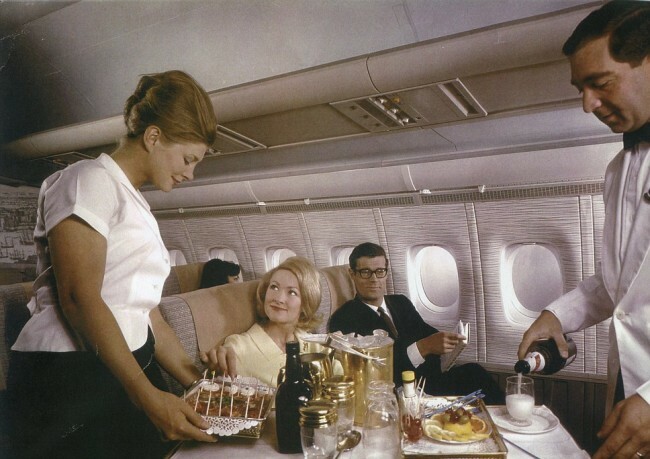 Most of then flew on airplanes is no first class do not remember. In fact, he was. 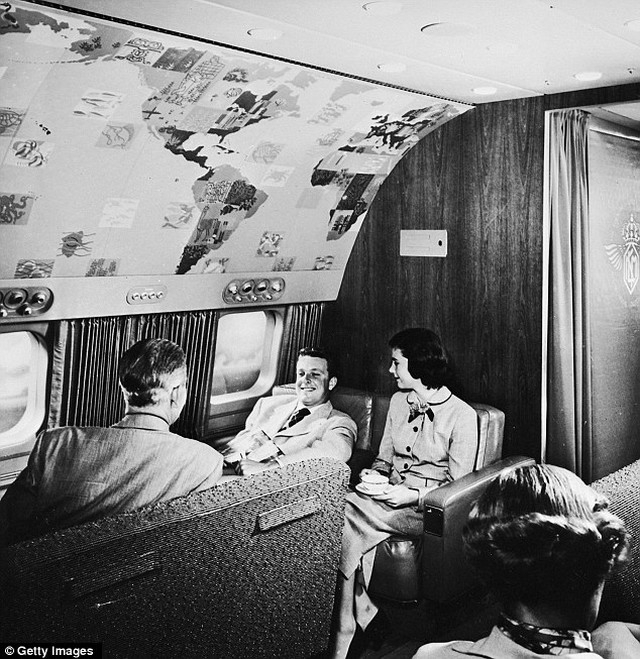 As such, it was first designed in the TU-104 (the beginning of operation – 1956). 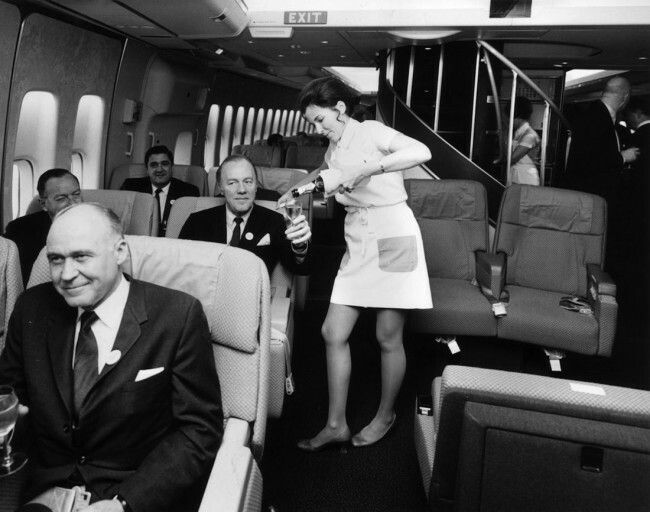 However, intra-flights machine altered: first class, sofas and other excesses were removed. Due to this increased number of seats. This also applies to the following aircraft models. 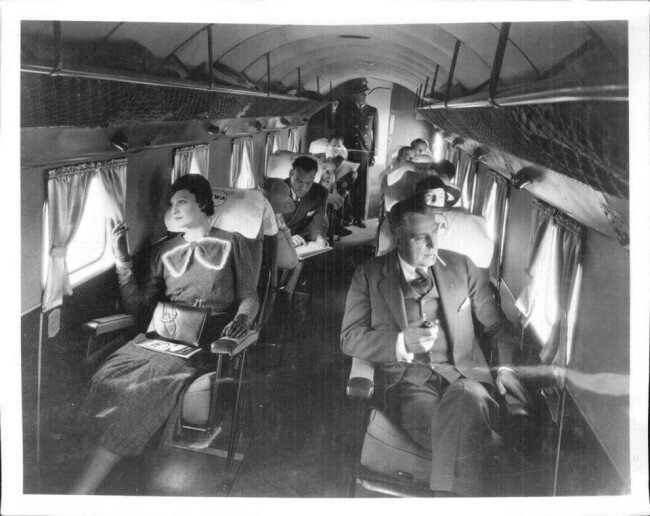 Therefore, intra-haul flights were not any classes, with very few exceptions.Through connections could get the first row. 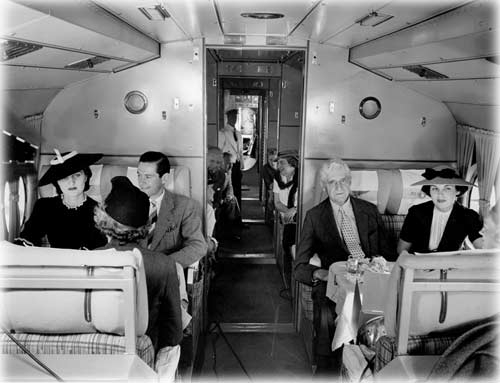 On several planes changed the layout of the first two or three rows and make more space between the seats, and that’s all the comfort. But were allowed to smoke! 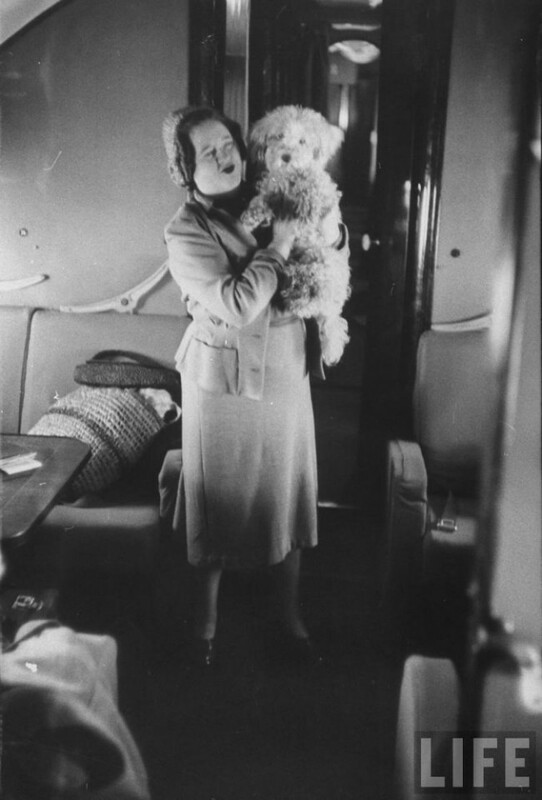 Dogs are allowed to carry directly into the cabin. 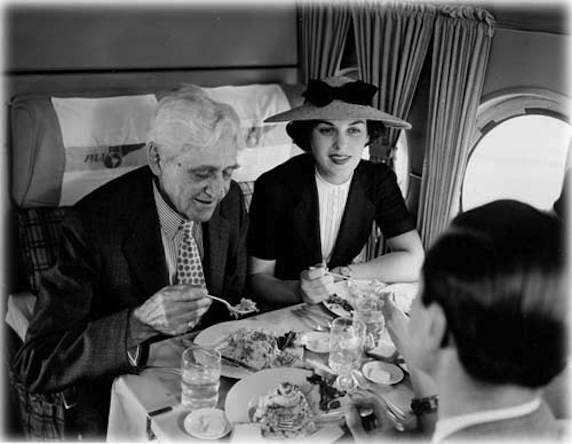 Often first-class seats were put ordinary people. 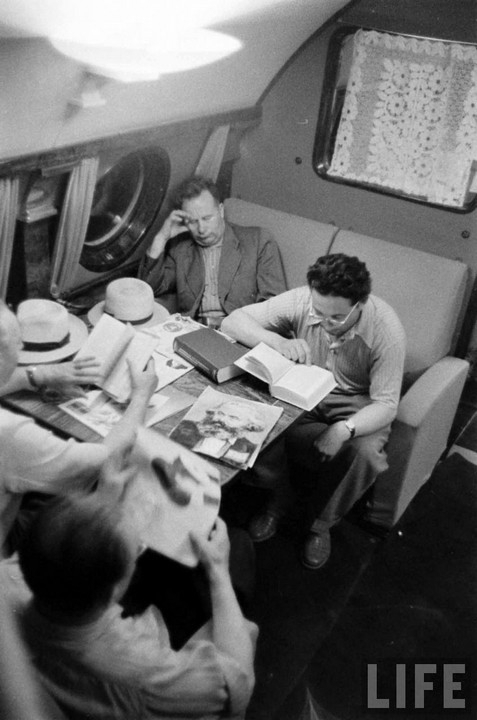 Soviet citizens during the flight were drinking alcoholic beverages is not the Americans, and read and talk about Karl Marx! 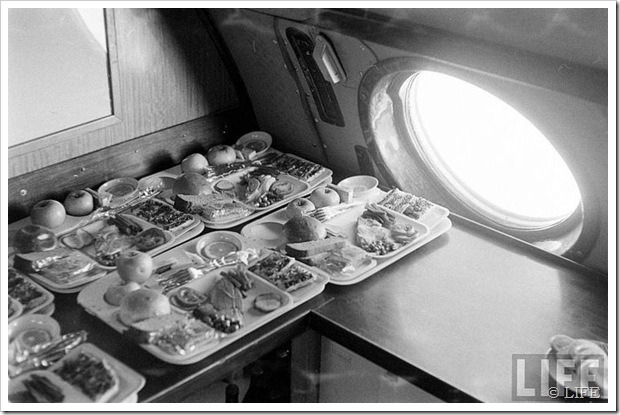 Kitchen on the TU-104. 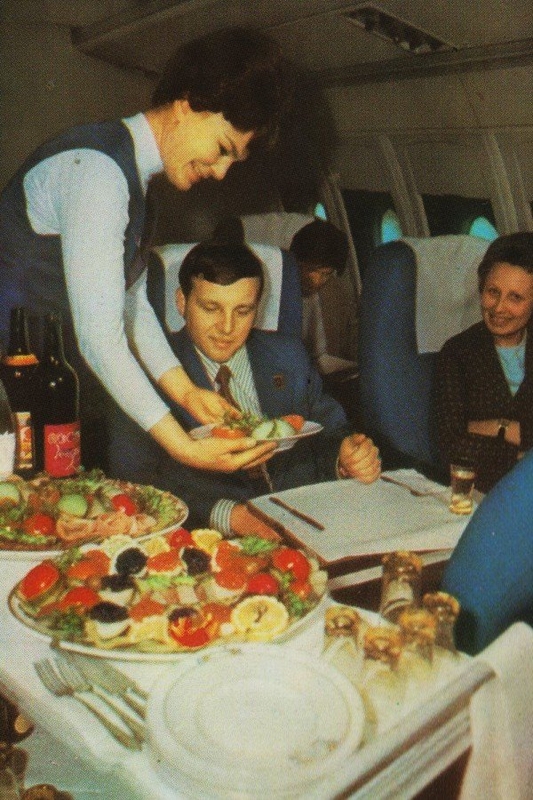 It was then the Soviet Union, the notion of food on board. Everywhere wood paneling and leather. All were impressed with the . .no TU-114 struck citizens even more. 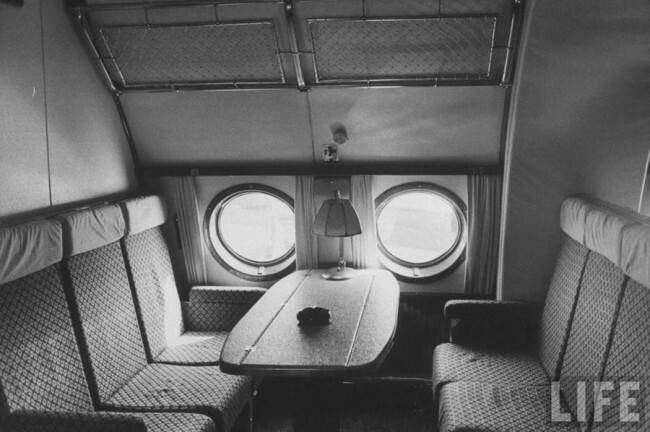 There were full bedrooms luxury coupe for three people. 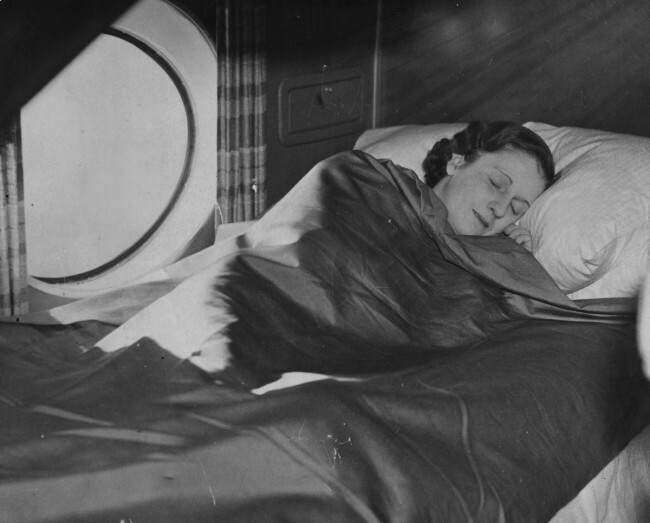 Passengers were given a pillow and a blanket. The Union also knew how to live beautifully. Shop the head of state in different versions TU-134. 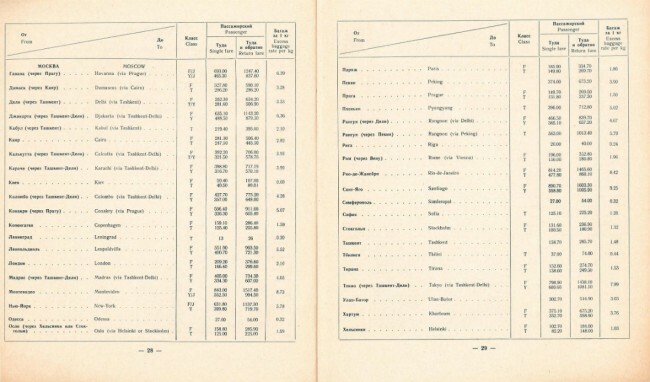 Here’s information brochure Aeroflot for winter 1961/62, you can see the order ticket prices. I recall that in 1962 the average monthly salary in the USSR was 84 rubles. 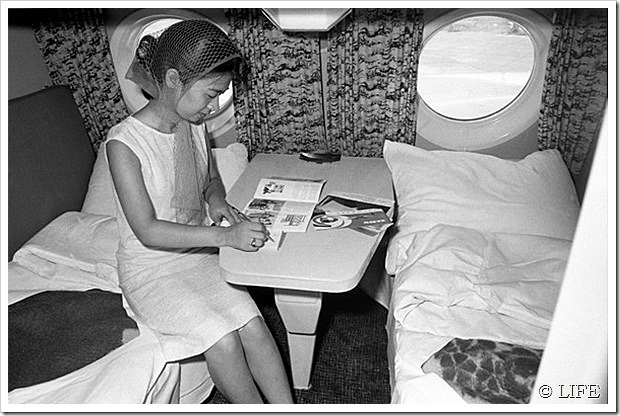 In 1973, the most expensive ticket, Moscow, Tokyo, worth 1658 rubles in the first class (with an average salary of 125 rubles). 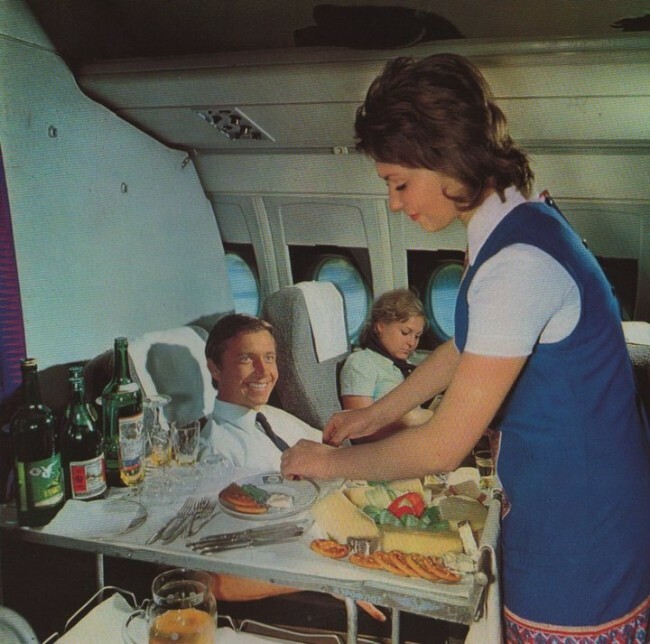 The first class in the TU-144. 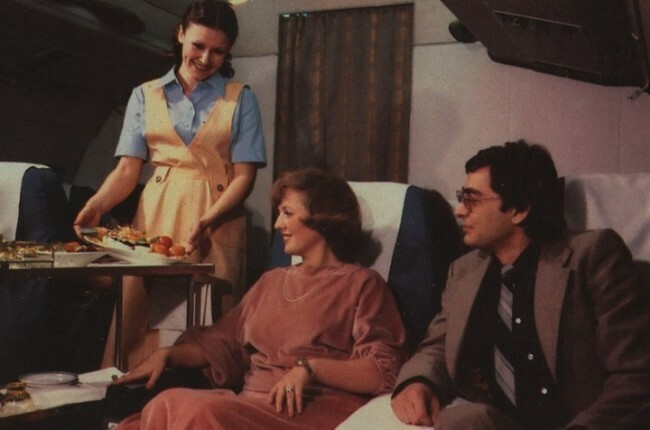 But Aeroflot promotional photos of the late 1980s – early 1990s.